Argentina is so big and varied that it is easy to see why travellers choose to visit and then keep coming back for more. Much like your favourite restaurant where you want to eat everything on the menu! Argentina is the eighth biggest land mass in the world and home to some truly incredible feats of nature, with beauty to rival anywhere else on earth. Regions such as the fertile wine growing valleys of Mendoza province, and the rugged granite wonderland of the Patagonian Andes often grab the travel headlines, however lesser known destinations such as Jujuy and Chubut provinces are just as deserving of the attention. Aside from breathtaking nature on show, Argentina is a rich cultural melting pot where regional traditions and customs remain very much part of daily lifestyles. Buenos Aires has emerged as one of the trendiest and most exciting cities in the world to visit. Undoubtedly the Latin American capital of fashion, design and architecture, BA serves up a rich and intoxicating mix of culture, comfort and fun. Take a tour of our distinctive neighbourhoods (either on foot, bike, or driving) such as Palermo, Recoleta, San Telmo and La Boca. Soak up the atmosphere at a game of polo, horse racing or a football match before spending the evening at a tango show or at one of the city´s many restaurants and bars. Good food and wine are easy to come by in the capital, and let´s not forget the thriving coffee culture. Travel just a short distance from downtown Buenos Aires and you enter a whole new world. The pampas, or plains, are a paradise of peace and tranquility. The endless horizon is broken only by the occasional cluster of trees, or by a gaucho astride his horse, rounding up a herd of cows. Argentina is known worldwide for the agricultural richness of its pampas, which were crucial in the development of the country during the 19th and 20th century. 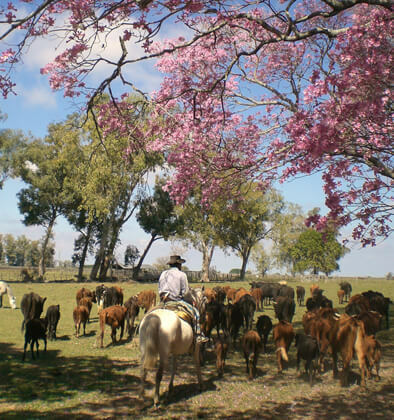 Most of the crops and meat that are exported by Argentina are produced on the estancias and farms of the area known as ‘Pampa Humeda’, and this vast and diverse region maintains to this day a vital role in the development of the national and even global economy. As a secondary source of income supporting the main economy of agriculture, many properties have opened up to tourism, and so there are several excellent estancias where you can ride horses, relax and perhaps even learn to play polo. Situated in the far north-east corner of the country, bordering Brazil, is the majestic natural spectacle of Iguazu Falls. A series of waterfalls amounting to one of the biggest in the world. Visitors can get up close and personal with the falls and enjoy spectacular views on both sides of the border. We can recommend and book the best hotels in which to stay depending upon your preferences. There are jungle lodges to choose from, or quieter wildlife-oriented hotels in the nearby town of Posada Puerto Bemberg on the border of Paraguay. 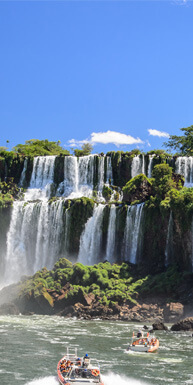 In terms of visiting the falls, we usually recommend a 2 or 3-night stay, with a full day on the Argentinian side and another on the Brazilian. The sheer power of this awe-inspiring sight has to be seen to be believed! 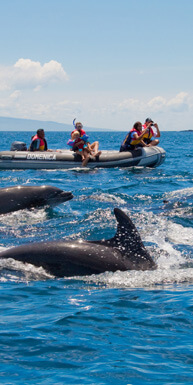 The Valdes Peninsula is a haven for marine wildlife. From August to mid-December, it is home to an important breeding population of the endangered southern right whales as well as elephant seals and sea lions. The orcas in this area (from February to March) have developed a unique hunting strategy to adapt to local coastal conditions. 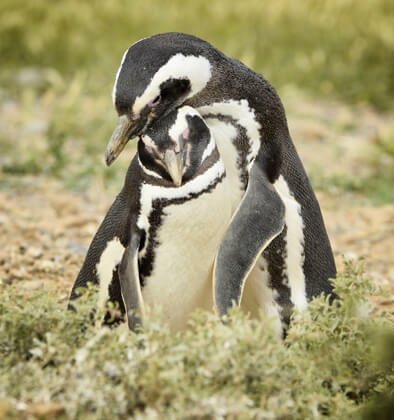 A few hours south is Punta Tombo, a 3 kilometer-long peninsula that between September and April is home to a vast number of Magellanic penguins that come to this site to incubate their eggs and prepare their offspring for migration. It is the largest such colony in South America. The area was settled by Welsh colonists in the late 19th Century, and the small town of Gaiman is well worth visiting for the excellent cream teas! The main attraction of this spectacular corner of Patagonia is undoubtedly the jaw-dropping sight of standing in front of the colossal Perito Moreno Glacier. 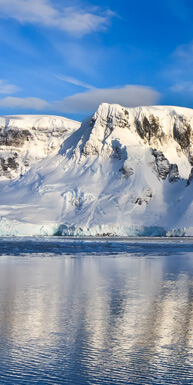 There aren´t many other places in the world where you can get so close to a glacier that isn´t retreating. 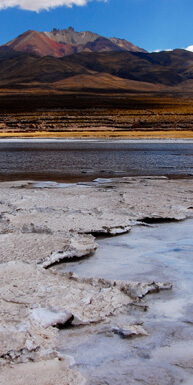 We recommend a day trip from El Calafate to explore the glacier and perhaps even do a guided ice trek. Another emblematic glacier where you can trek or take a boat trip is Viedma Glacier on Lago Viedma to the north. For anyone who wants to experience trekking in the Andes, there is surely no more rewarding or accessible place in which to indulge than El Chalten. This alpine town is located beneath the towering peaks of the Fitzroy Massif, within Los Glaciares National Park, and trailheads for numerous walks start and end from the town. The most famous treks are to ´Laguna de Los Tres´ and to Laguna Torre. We work with the best local guides in El Chalten and can arrange multi-day trekking expeditions with all equipment provided, or simply day walks from any of the hotel bases in the town. The end of the world! Around 500 years ago, European explorer Ferdinand Magellan approached this unknown land at the southernmost extreme of the American continent, and saw dispersed fires and floating columns of smoke rising from the dawn mist, hence the island was named ´Land of Fire´. Of course, these campfires belonged to the native population, who had inhabited the island for approx. 12,000 years but were soon all but entirely decimated by the subsequent arrival of Europeans. The territory is shared with Chile and is characterised by a harsh climate on account of the geography of the region. The Magellan and Beagle channels were once important yet perilous navigation trade routes, however since the construction of the Panama Canal the southern route was no longer necessary to link the Altantic and Pacific oceans. Today you can take boat trips to visit some of the out-lying islands when the waters are calm. Once considered a remote and inhospitable place, today Ushuaia is very much on the tourist map of Argentina as people flock to see the end of the world, many “en route” to Antarctica. Tierra del Fuego National Park just outside of the town is a must-visit for trekking and sightseeing, and if time permits then we recommend venturing further into the remote interior of the island where there are some incredible opportunities for estancia stays and horse-riding excursions. Situated at the north-western gateway to Patagonia, hugging the foothills of the Andes moutain range, is the idyllic and beautiful Lake District region. Lush green hills contrast with emerald green rivers and glacial lakes. Here you´ll find granite mountains, active volcanoes, tranquil towns populated by European descendants, native Mapuche settlements, and forests of monkey-puzzle trees. 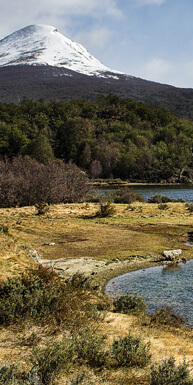 You´ll struggle to find a more picturesque place than the Patagonian Lake District! The outdoor adventure hub and main town in the region is San Carlos de Bariloche, situated on the shore of the gigantic Lago Nahuel Huapi. Here there are a wide choice of lakeside hotels to choose from, and some fabulous treks (such as Cerro Catedral and Cerro Tronador) as well as various opportunities for watersports are on your doorstep. 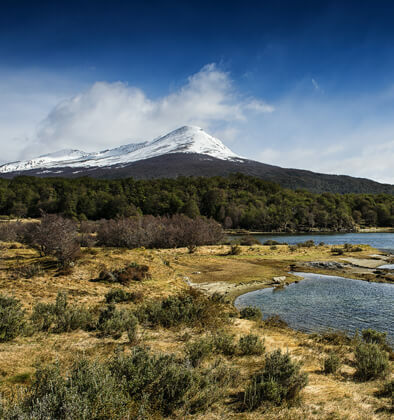 From Bariloche you can also cross over to Chile on the iconic Andes Lake Crossing from Llao Llao to Petrohue. Drive the scenic ´Seven Lakes road´ from Villa La Angostura to San Martin de Los Andes, a pretty little alpine town and a great place to be based for a few days. 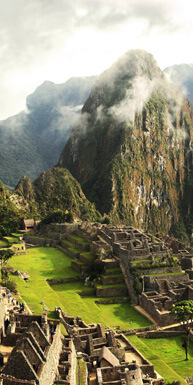 South America´s hidden gem of a destination. Ask an Argentinean which part of their country they think is the most stunning and many will name the northwest regions of Salta and Jujuy. In terms of international tourism, they have long been overlooked in favour of Patagonia or northern Chile, however word is slowly spreading about the incredible beauty that this corner of the country has to offer, and rightly so! Ideal for road trips due to the close proximity of highly contrasting natural and cultural attractions, our Fly Drive program is perfectly designed to visit the region. Wine lovers should include a visit to Cafayate in the south of Salta Province, where Malbec and other varieties are grown at high altitude giving a distinctive regional taste. Further north in Jujuy Province you´ll discover otherworldly rock formations in the many gorges and valleys that give the landscape its highly distinctive character. Not to forget the Andean high plateau where glistening white salt flats indicate the high passes in to Chile and Bolivia. Andean culture is abundant and easily accessible villages are scattered all over the region. 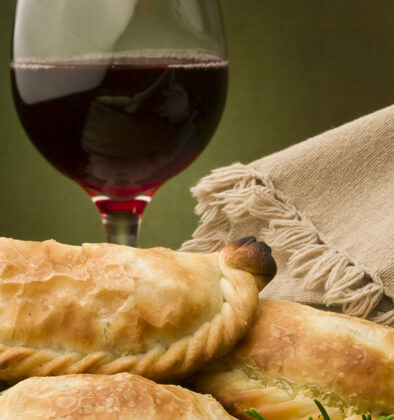 The pace of life is slower up here and the empanadas as tasty as they get! Mendoza remains the undisputed wine capital of Argentina and arguably the best wine producing region in South America – although some Chileans may disagree! A visit to Argentina is certainly not complete for wine lovers without a visit to Mendoza. Located around the towns of Chacras de Coria, Luján de Cuy, Maipu, and further south in the Uco Valley, there are numerous vineyards that also serve as superb hotels and make excellent places to stay. Many also have world class restaurants showcasing some of the best food in Argentina. As Mendoza is such a fantastic destination for eating & drinking, it´s a good thing there are also ample opportunities for more active experiences to burn off the calories! The Andean foothills provide the perfect playground for trekking, rafting, and mountain biking activities. 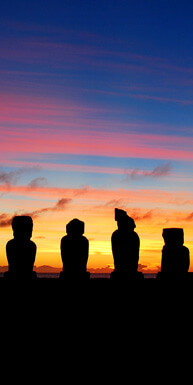 All of which can be easily arranged with our expert local guides. Alternatively, why not combine the best of both worlds by taking one of our horseback or cycling vineyard tours! LOOKING FOR ARGENTINA’S TOP DESTINATIONS?